Madaba, is the capital city of Madaba Governorate in central Jordan. It is best known for its Byzantine and Umayyad mosaics, especially a large Byzantine-era mosaic map of The Holy Land. Madaba has a very long history stretching from the Neolithic period, the town was once a Moabite border city. Madaba is located 30 kilometers south-west of the capital Amman. It is compact and easily explored on foot, with some excellent hotels and restaurants, and is less than an hour by regular public transport from Amman, so it's worth considering as an alternative to Amman as a place to stay. Madaba’s main attraction is its magnificent Byzantine mosaics, drawing many visitors, especially since the creation of an archaeological park. They cover the floors of houses and churches dating from the site’s earliest period of habitation. A school of mosaics has also been founded here. Visitors to the town should not miss these magnificent pavement decorations, before heading off to see the surrounding Biblical sites of Mount Nebo and Bethany, where Christ was baptized. Southwest of Madaba is Hammamat Ma’in, the thermal mineral springs that for centuries have attracted people to come and immerse themselves in the sites’ warm therapeutic waters. There is an excellent 5-star hotel operated by the well known Six Senses group here, which offers indoor and natural outdoor hot pools, a swimming pool and spa facilities. Um er-Rasas (Kastrom Mefa'a) is located south-east of Madaba on the edge of the semi-arid steppe. Um er-Rasas was nominated as a World Heritage Site in 2004. This archaeological site, which started as a Roman military camp and grew to become a town from the 5th century, is largely unexcavated. Mt. Nebo offers a fantastic view westward, with a vista that includes the Dead Sea, the West Bank, the Jordan River, and, on a clear day, Bethlehem and Jerusalem. 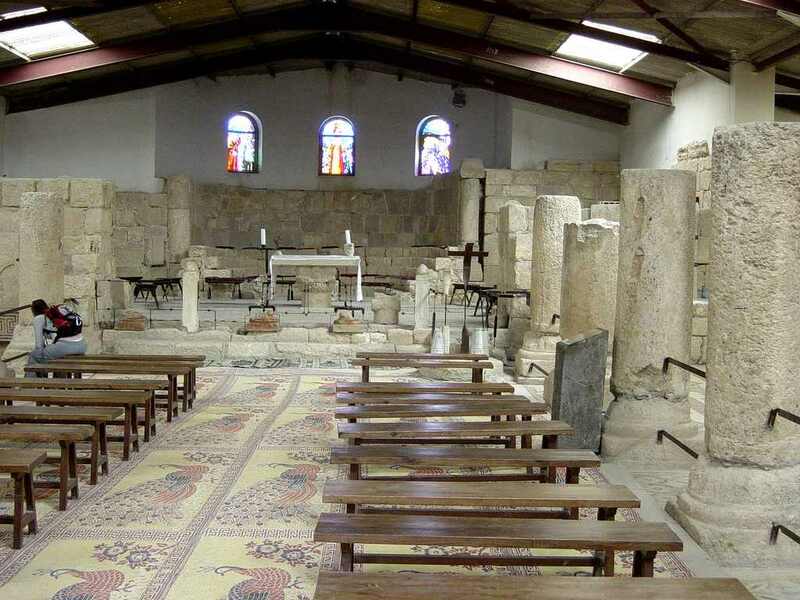 At the southern entrance to Madaba, near the King’s Highway, is the Church of the Apostles. The ruins of this Byzantine church date to 578 CE, and are currently being restored. One of Madaba’s most beautiful mosaics adorns the floor of this church. The mosaic is known as "Personification of the Sea" and it vividly depicts a woman emerging from the sea, surrounded by mythical aquatic creatures and a hodgepodge of rams, bulls, parrots and exotic vegetation. The mosaic was signed by a mosaicist named Salamanios. Enjoy Egypt and Jordan 10 Days. Low Cost Egypt Jordan Itinerary. Book Egypt and Jordan Tours Budget to Cairo Pyramids, Nile Cruise Luxor Aswan, Amman, Petra & Wadi Rum. Escorted Egypt and Jordan Tour Package at Very Special Rate. Wadi Rum also known also as The Valley of the Moon, it is a very spectacular desert resort that is situated in south of Jordan, about 70 km to the north of Aqaba. It is the largest wadi in Jordan & among the main tourist attractions being the most stunning landscape in World. Mount Nebo is a high mountain located 10km/6 mi NW of Madaba in Jordan. This Monastery is located on a hill overlooking the Holy Land and is believed to be the burial place of Moses. The view from the summit provides a panorama of the Holy Land and, to the north, a more limited one of the valley of the River Jordan. Jerash is known for the ruins of the Greco-Roman city of Gerasa, also referred to as Antioch on the Golden River.It is Located some 48 km (30 miles) north of the capital Amman. The impressive, beautifully preserved ruins of Jerash include places of worship from the Hellenistic, Roman, Byzantine and early Muslim periods. The Dead Sea, "Sea of Salt"or the "Sea of the Arabah," this inland body of water is appropriately named because its high mineral content allows nothing to live in its waters. It is called the Dead Sea because its salinity prevents the existence of any life forms in the lake. Amman‎ is the capital and largest city of Jordan and one of the oldest inhabited places in the world. It is the country's political, cultural and commercial center and one of the oldest continuously inhabited cities in the world. It is a major tourist destination in the region especially popular among Gulf tourists.